As Buddy the Elf likes smiling and smiling is his favorite, I can’t get enough Christmas cookies. If you aren’t convinced already, let me encourage you to share cookie love. You can play lovely music and bake cookies by yourself, with children, with family and friends, and with a people-packed kitchen. Cookies are so much easier to make than cakes, pies, candy. They are relatively inexpensive to make if you stick to basic ingredients.. You can make them ahead of time and freeze them. You can share cookies. The picture in this post is of the first cookie plate I received this season (Thank you, Lisa!) You can make 8 dozen of one type of cookie, get together with 7 friends who make 8 dozen of a different cookie each, then swap the cookies for a total of 8 dozen different cookies each. You can give cookies as gifts as well as have them available to serve guests. Consider having a Holiday Open House and simply serve cookies and festive beverages. Also, I’m not above purchasing store-bought cookies. Trader Joe’s has the best selection to include Triple-ginger cookies, Peppermint Joe Joes, and pretty chocolate dipped star shaped cookies, regular sized and miniature, to pretty up any cookie collection. Do you have any recommendations for new recipes to try? I’m looking for an Italian anise cookie, a peppermint cookie (I make several flavors of icing for our sugar cookies: peppermint, orange, lemon, almond, and anise), a Nutella cookie (or maybe I’ll stick with Nutella fudge), an oatmeal and toffee cookie, and perhaps a no-bake rum ball. What are your favorite Christmas cookies? If you have any cookie questions, ask away! 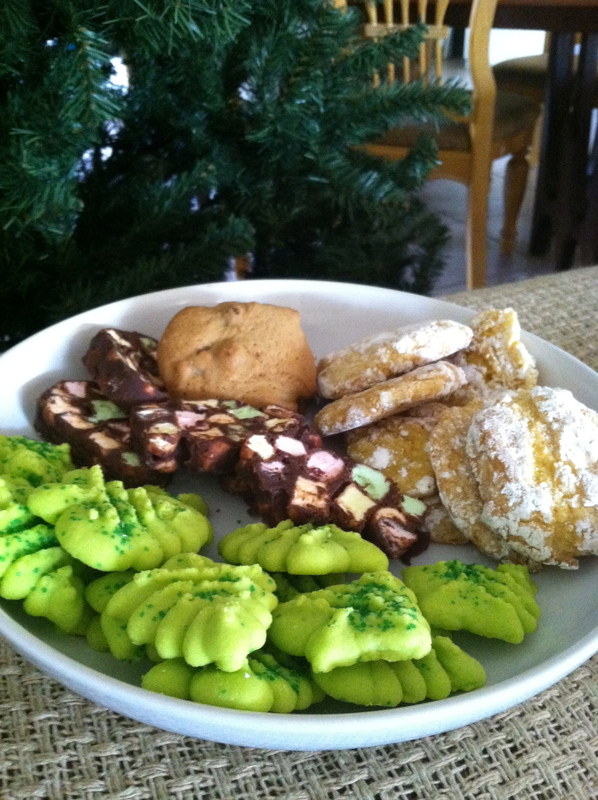 This entry was posted in Food, Lifestyle and tagged Christmas, Cookie, Family, Recipe. Bookmark the permalink. They look wonderful! Unique…a bit savory and the shape is unique. Bring on more cookies! Those look delicious! As someone who can’t stand peanut butter, I like the twist on the classic hershey kiss/PB cookie. Thanks, Devin. 🙂 I wished I could grab them right off the computer, lol. I can see this may become a dangerous place to keep one’s figure in order. I shall feast on your words regardless. Cheers!